Published in the South Kent Gazette, 18 December, 1979. The Priory grounds were at that time a farmyard, on the northern side of which was the residence of Mr John Coleman, the lessee. On that occasion, Dr Plumptre obtained permission to open the ground and explore the foundations of the church, which he partially did, and he arranged for Mr Ayers to make notes of any discoveries made during his building operations. Dr Plumptre visited Dover again during the summer of 1846. 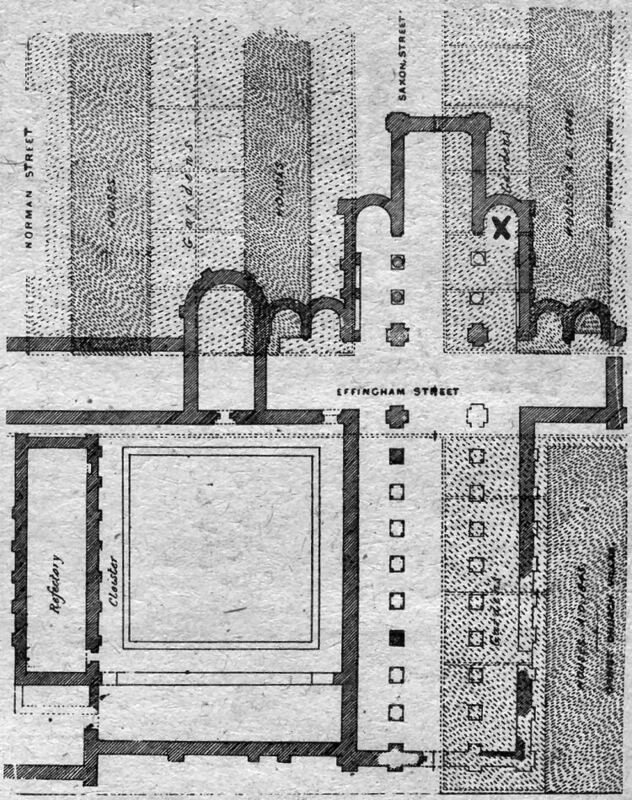 At that time Effingham Street had been made beside the east end of the Refectory and directly over the transept and the nave of the church. The building of the houses in Effingham Lawn had been commenced; the wall of the south side aisle of the choir had been laid bare, and being perfectly sound, Mr Ayers built the back wall of a portion of the houses in Effingham Lawn upon it in order that a substantial part of the Priory church should be preserved. This ancient wall was left about 3ft. above the ground, and could be seen in the back yard of No. 2 Effingham Lawn. A niche, with caps and bases of Caen stone from the inner facing of the south side of the choir was built into the back wall of No. 1, Effingham Lawn, but that, however, is cemented over, and is not now visible. While the builders were laying bare the south wall of the choir, they found thirty silver coins of the reigns of Henry I and Henry II, a few of which were taken by Dr Plumptre, a few were taken by another gentleman, and the remainder Mr Parker Ayers presented to the Dover Museum. These coins were not under the foundation stone, but in a hole in the wall, and from the dates of a portion of them, it is evident that they were a hoard hidden there after the church was built. 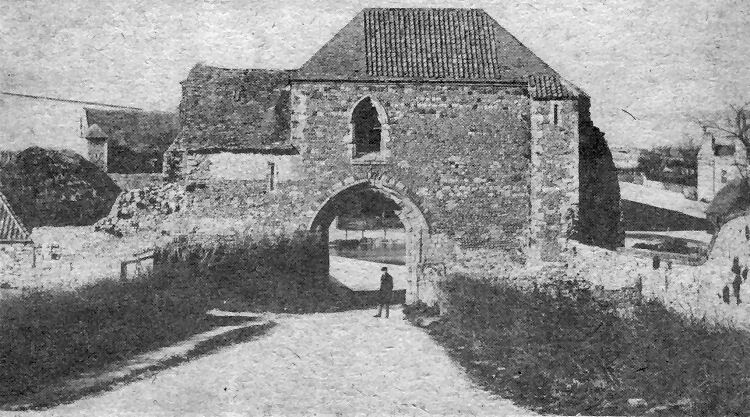 AN EARLY picture of gateway of the old Dover Priory viewed from Folkestone Road, Believed to date from about 1850 it shows one of the properties in Effingham Crescent, on the right, which was built about 1846 and, on either side of the picture are thatched barns of Priory Farm. Above the thatched room on the left is a section of the building popularly referred to as the Strangers Hall, adjoining which was a farmhouse. Through the archway can be made out one end of the monastic fishponds which stretched as far as the barn on the right. Dr Plumptre again visited these ruins in 1847, when both Saxon Street and Norman Street had been laid out, and from the observations made on these three visits, he drew up a complete ground plan of the church, as well as of other buildings. The result of these investigations was to place on record a comprehensive idea of the vast extent of the Priory buildings, such as had never before been entertained. The church was the noblest structure, being 285ft. long internally, and 70ft. wide, occupying an area of 20,328 superficial feet. The west wall stood beyond the west end of the Refectory, and the east end extended down Saxon Street as far as the lower house of Effingham Lawn. The south aisle of both nave and choir was wholly within the back gardens of Effingham Villas and Effingham Lawn. The transepts are crossed by Effingham Street, the south sept extending a few feet beyond the front of the first house in Effingham Lawn, and the north sept ended opposite the north side of Saxon Street. The aisles of the choir ended on each side with apsidal chapels, and the chancel beyond finished with a square front. Each sept had in the east wall a double apsidal chapel, which was an uncommon feature. The colonnade of the nave and choir on both sides extended about 260ft., and the central tower rose over the transept at the junction of Effingham Street and Saxon Street. The other buildings were the Refectory, already mentioned the Chapter House on the north side of the transept, the dormitories, and other domestic offices extending down Effingham Street as far as the turn to Effingham Crescent, the infirmary at the top of Norman Street, the buttery and the Prior’s lodge at the west end of the church and Refectory, the gate-house further west, and, beyond that, in the south-western corner of the grounds, the original Priory barn. The gateway and barn were erected after the close of the Norman period. There was a library, the catalogue of which and some of the manuscripts are preserved in the Bodleian Library, Oxford. On the northern part of the grounds were found two other ancient buildings. The one, which was entire, was called the Strangers’ Hall, but Mr Tavenor Perry thought it might be the brewhouse and bakehouse, added about 100 years after the first buildings. This was originally 85ft. long, and 34ft. wide, divided longitudinally by circular pillars and arches of the, transition period, into two unequal chambers, with a small room projecting from the north side. The excellence of its architectural features was considered out of character with a bakehouse, but everything at the Priory was built on a grand scale, and the fact that the field adjoining is called Baker’s Close, rather confirmed the idea. The reason against it being called the Strangers’ Hall was that a little further north-east, beside the Headmaster’s modern residence, were the remains of a much larger building, which, from its situation and size, seemed more likely to have been the guest house. Adjoining this, is a substantial portion of the north boundary wall, and this, previous to 1845, was continued all round the area now bounded by Priory Hill, the railway, the Folkestone Road, and Priory Road, the enclosed lands at the north-east corner, now occupied by Norman Street and Effingham Crescent, having, in the old leases, been termed the Convent Garden. Below right is a ground plan of the old Priory church superimposed on a plan of the houses built on its foundations. They were in Norman Street, Saxon Street and Christ Church Villas and Effingham Lawn, facing Folkestone Road, which were built in the mid-1850s. Under foundations at the point marked X were discovered 24 silver coins of the Reign of Henry II. They were badly corroded but one bore the date 1134 which was probably the date the monks began building their church. The Refectory, which survives, is shown bottom left. The College Close formed the arena for the representation of the Dover Pageant by over 2,000 performers in 1908, when a stand, to accommodate 5,000 spectators, was erected in front of the school house. The pageant was a great spectacular success, but a financial failure. The master of the pageant and principal author was the well-known playwright and novelist, Mr Louis N. Parker. He arranged a pageant consisting of seven episodes, representing popular versions of the principal events in Dover history, commencing with the mythical death of Gawayne, one of King Arthur’s Knights, a paraphrase of an incident in Malory's account of the Arthurian legend, followed by King Arthur's refusal to pay tribute to the Roman Emperor Lucius. The next episode recorded the entry into Kent, in 1066, of William the Conqueror, and his pact with the Men of Kent by which “Invicta“ became the Kentish motto. The third episode recorded King John’s surrender of the Crown to the Papal Legate, and the sailing of the Cinque Ports Fleet which defeated the fleet of the pirate chief French leader Eustace the Monk in the famous Battle of Dover. Episode IV recorded the visit of Edward I and Queen Eleanor. Episode V was part of Shakespeares's "Henry V."